The Bruce Building, Percy Street, designed by the architect Joseph Oswald. Location: Percy Street, Newcastle upon Tyne. 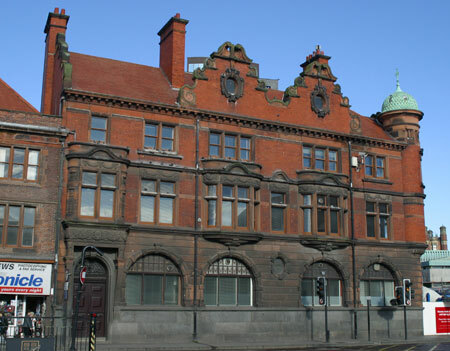 The building was designed by local architect Joseph Oswald for Newcastle Breweries and was erected between 1896 and 1900. A bricklayers' strike during its construction added to the time it took to complete. It is an imposing, three storey building constructed of red Dumfriesshire sandstone and red bricks from Commondale, North Yorkshire, on a grey granite plinth. It is described in Pevsner's Buildings of England as having 'much Jacobean carved ornament, first floor oriels and a corbelled corner turret with copper fishscale dome'. As well as housing offices the Bruce Building and surrounding brewery complex contained a mineral water works, beer-bottling plant and wine and spirit stores in the basement. There was also a stable for 36 horses, a blacksmith's forge and coopers' and joiners' shops. An engine and boiler house provided enough current to light the entire premises, work the hoists, operate ventilators and run all the equipment in the mineral water factory. Under the stable yard were cellars which were reached via the brewery's bonded warehouse in nearby St Thomas' Street. In the 1950s the Bruce Building was compulsorily purchased from the brewery for the extension to King's College, part of the University of Durham. King's College became the University of Newcastle upon Tyne in 1963. Its use as a higher education establishment brings the story of the Bruce Building full circle as the site was formally occupied by the Percy Street Academy, Newcastle's first college founded in 1806 by John Bruce. Among its 'old boys' are the engineer Robert Stephenson and the artist William Henry Charlton. The building has a monumental interior which was definitely designed to impress the visitor. Some of the text has been taken from a website designed and produced by the Sine Project. The following pages were designed by MIRROR IMAGE. All photographs taken by Ray Urwin©.